San Francisco rent crisis. The solution isn’t in the city. It’s in the suburbs. San Francisco, pictured above, has the highest rents of any large city in the U.S. But lately, it’s been building more housing units per capita than New York City or Los Angeles. San Francisco has the highest rents of any large city in the U.S. The city doesn’t build nearly enough housing. But it doesn’t deserve to be the poster child for inaction in the face of inequality: In 2014, San Francisco built about 30 percent more housing units per capita than New York City, and more housing units per capita than Los Angeles. Between 2007 and 2014, San Francisco issued as many permits per capita as booming Santa Clara County, home to San Jose and Silicon Valley, one of California’s fastest-growing counties. The biggest problem with housing in San Francisco isn’t actually in San Francisco. It’s in the suburbs. Nor should it be. Once upon a time, a forward-thinking planner might have conceived of the region as three high-density nodes of housing and jobs, in San Francisco, San Jose, and Oakland, with quiet bedroom communities strung like beads along commuter rail lines and highways. But that vision has long since been dashed by the Bay’s unusually sprawling geography of employment. Of the 1.75 million jobs within 35 miles of downtown San Francisco, only 45 percent are within 10 miles. That’s 12 percentage points lower than average for a big U.S. city. Adding new housing only in the big three cities, then, will only exacerbate the region’s transportation woes. To some extent, job sprawl in the Bay has the same causes as elsewhere. Manufacturers sought cheap land and highway access. Pulled by emigrating executives, white-collar work shifted to campuses and office parks. Retail and services followed consumers down the highway. Three decades later, Dowall’s words perfectly describe San Mateo County—San Francisco’s visually suburban neighbor to the south, home to Oracle, Facebook, and YouTube—which hosts almost one job for every two residents. (That’s a considerably higher ratio than Westchester or Nassau Counties, adjacent to New York City, and nearly as high as San Francisco itself.) It’s also the most expensive county in the Silicon Valley region to buy or rent a home. The wreckage of this perfect storm: A region with housing costs so high they are a drain on national economic indicators, zoning restrictions so stringent they push new residential construction to the fringes of the East Bay, and an average commute that takes longer than it does in Los Angeles. So, how do you get existing suburbs to build their share of housing? In the Bay, at least, the Association of Bay Area Governments (there are nine counties and more than a hundred municipalities) has for years set forth a “Regional Housing Need Allocation” that suggests how much housing various counties and towns should build. They rarely cut it: Marin County, where George Lucas is building affordable housing to spite his NIMBY neighbors, didn’t clear 30 percent of its “objective” in 2014. San Mateo was at 42 percent. The region as a whole built half what had been deemed necessary. In 2008, with climate change in mind, Sacramento required the state’s metropolitan regions to draw up long-term plans for urban growth. Five years later, ABAG and the Metropolitan Transportation Commission (a more powerful regional organization) introduced Plan Bay Area—a proposal to funnel the majority of housing and business growth into just a few key areas. 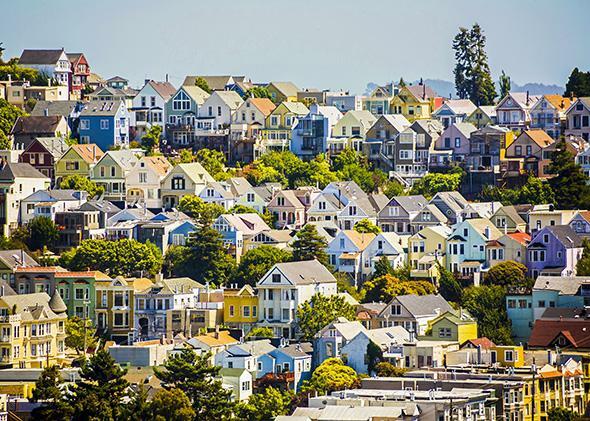 “The three main cities of the Bay Area, while there may be background noise, have made significant and sustained commitments to housing,” says Randy Rentschler, the director of legislation and public affairs at MTC. Elsewhere, progress has been spottier. “There is every incentive not to do it, economically,” he says. But in contrast to the toothless RNHA, the commission controls about $1.5 billion in regional transportation funds each year. For municipalities, Rentschler said, the offer is simple: Build more housing, get more money. With homes and jobs closer together, commutes get shorter, easing the weight on the region’s sagging transportation infrastructure. With better incentives to allow more construction, cities might start building enough housing to bite into the monthly rent increases. Suburbanites, who always seem to value the freedom to drive more than the freedom to build, can relax. The Bay Area is not being Manhattanized—or even Brooklynized—at any scale. Plan Bay Area is neither radical nor combative. It directs housing and job growth primarily to jurisdictions that want it. Housing advocates have complained that, far from pushing for more balanced, regional urbanization, it concentrates 95 percent of 30-year housing growth in just 15 of the region’s hundred-plus cities. But suburbs are a hard nut to crack. New York’s Westchester County, which is half detached single-family homes despite boasting one of the world’s best commuter railroad systems, has been ignoring a court-ordered fair-housing plan for six years. Its county executive, Rob Astorino, has railed against “social engineering” and even asked if HUD also planned to break up ethnic urban neighborhoods. Surely Astorino was being sarcastic, but that’s exactly what affordable, proximate suburban housing did to white ethnic enclaves in the 1940s and ’50s. It was a terrible thing for U.S. cities then: San Francisco’s population, like that of most other U.S. cities, fell for three straight decades. Suburbs employed racial covenants and other measures to keep out blacks. Car dependency was etched into the landscape. But a modern-day building boom in the inner suburbs wouldn’t repeat those mistakes—it would correct them. This time, it would do a city like San Francisco good.